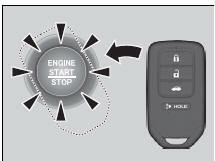 Touch the center of the ENGINE START/ STOP button with the H logo on the smart entry remote while the ENGINE START/ STOP button is flashing. The buttons on the smart entry remote should be facing you. ► The button flashes for about 30 seconds. Depress the brake pedal (continuously variable transmission) or clutch pedal (manual transmission) and press the ENGINE START/STOP button within 10 seconds after the beeper sounds and the ENGINE START/STOP button changes from flashing to on. 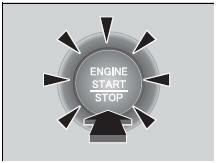 ► If you don't depress the pedal, the mode will change to ACCESSORY.